You are a king in the Dark Ages who is about to embark upon a journey that changes history. Choose your country and forge its destiny. Your capital is surrounded by barbarians settled on the lands, but you feel that in your hands these provinces could mean much more. Your subjects trust that you will bring them prosperity and glory. Develop your production and engage into trade to gather precious resources that will allow you to claim the lands which are rightfully yours. You may be a peaceful trader who fills the royal treasury with gold, but for the other kings your wealth is a temptation. You can build forts to defend your lands or you can take fate in your own hands and prepare for battle. As armies grow bigger and stronger, war is inevitable! The time has come for wise kings to prove themselves as military leaders. Become a true warrior to defend your lands and test your forces not only against barbarians, but against enemy kingdoms. Whether you strive to be a mighty warrior or a peaceful trader, the power is in your hands. 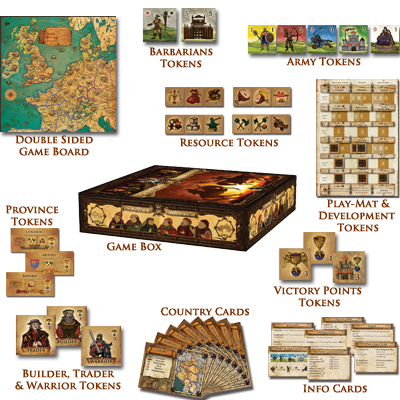 Conquer your opponents or outwit them to build the most prosperous kingdom in the Dark Ages. This is your chance to rewrite the history! 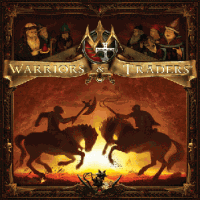 Add a Review for "Warriors & Traders"